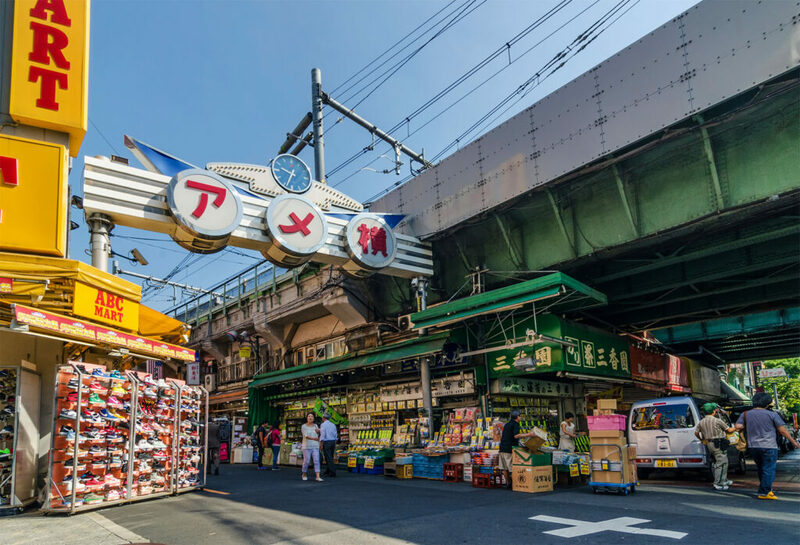 Okachimachi is a busy commercial district of Taito and is home to the well-known Ameyoko shopping street which is within easy walking distance. Okachimachi Station御徒町駅・おかちまちえき (御徒町: 御 – respectfully 徒 – walking 町 – town) is a small station with four platforms serving the 山手やまのて・Yamanote and 京浜東北線けいひんとうほくせん・Keihin-Tohoku Lines. The name Okachimachi means, “respectfully-the walking town,” because it was a town where many lower rank samurai lived. Those samurai were called 徒士かち・walking soldiers because they were forbidden to ride horses. Ameyoko, meaning candy alley for the Japanese 飴あめ・candies that used to be (and still are) sold here, is a street market more typical of those found on mainland Asia. There are more than 180 stores and the street itself is full of stalls selling everything from fresh 海鮮物かいせんぶつ・seafood and 果物くだもの・fruit to 衣類いるい・clothes and 時計とけい・watches. It’s also a great place to find お土産おみやげ・souvenirs to take back home, and unlike the rest of Japan, bargaining is both permitted and expected here. If you didn’t find what you were looking for then check out 多慶屋たけや・Takeya whic is the oldest discount store in Tokyo and just a two minute walk from Okachimachi Station’s north 北口きたぐち・exit. The store has an abundant selection of goods from 食べ物たべもの・food, 衣類いるい・cloths, 装飾品そうしょくひん・jewelry, 薬品やくひん・medicine, 電化製品?? ?・electronics, ?? ?おもちゃ・toys, and more. Didn’t find what or the you wanted at the price you wanted at Takeya? Look around because there are many other discount stores in the area. Walking town will provide you with a great deal of eye candy and exercise too. Bargains that you strike for yourself along the way are an added bonus.